Words, Terms and Expressions you might hear or use while at the beach. In dog Surfing circles this has been modified to: Bark-a-bunga, Bow-wow-a-bunga and or Cow-a-Barka. The un-broken face of a wave. The Ultimate place to be. Top of a surfboard. The part you and/or your Surf Dog stands on. A curved piece of plastic or fiberglass mounted to the bottom back of the surfboard used to keep the surfboard going the direction you want to go. You can have one, two three or four fins mounted to the bottom of a surfboard. Heading into the water to surf. Rookie or beginner Surf Dog. A long narrow surf board used for large waves. The location where the waves are breaking. The beach side of the breaking waves. The act of pushing your Surf Dog into a wave. A strap used to connect a Surf Dog to the Surfboard. The direction one surfs a wave as referenced by the surfer riding the wave. From the beach he appears to be going right. The front tip of the surfboard. Beyond where the waves are breaking. Your Surf Dog's collection of surf boards. Devices used to hold your Surf Dog's surfboards, either on top of your vehicle or in your garage. The edges or sides of a surfboard. A light garment you wear while in the water to protect you and your Surf Dog from the harmful UV rays of the sun. The direction one surfs a wave as referenced by the surfer riding the wave. From the beach he appears to be going left. A Surf Dog riding a wave has the right of way. Stay out of their way! The rush of water heading back out to sea after waves have hit the beach. Experienced surfers use this to get outside. If you get caught in one, relax and swim parallel to the beach. Having a really good ride. Surf Dog Retriever. This a friend or family member who is helping you in the water. They are helping to watch out for the safety of your Surf Dog and helps you retrieve your Surf Dog when they surf or swim in to the Beach. Also helps to get them turned around and back out to you to ride another wave. Especially helpful in Surf Dog Competitions were you only have a limited about of time. The white water created after a wave breaks. This is what most Surf Dogs ride to the beach. The great feeling you and your Surf Dog feel while surfing together and with friends. The end of the surfboard. 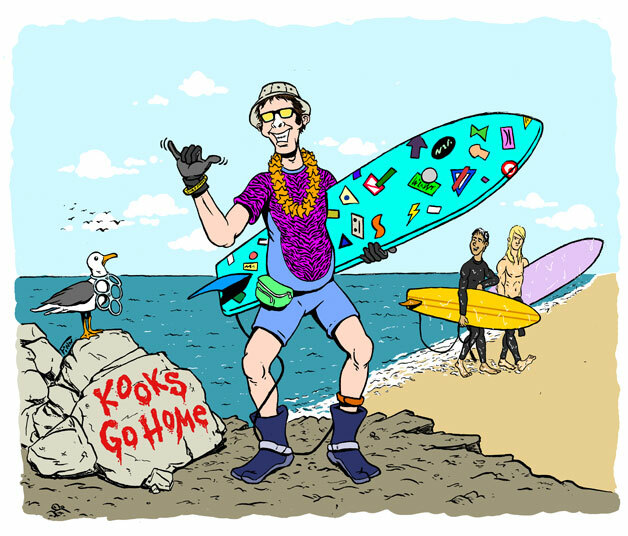 Don't be a KOOK:The GQ Guide to Surf Etiquette. and other surf style authorities. Just click on the Illustration!